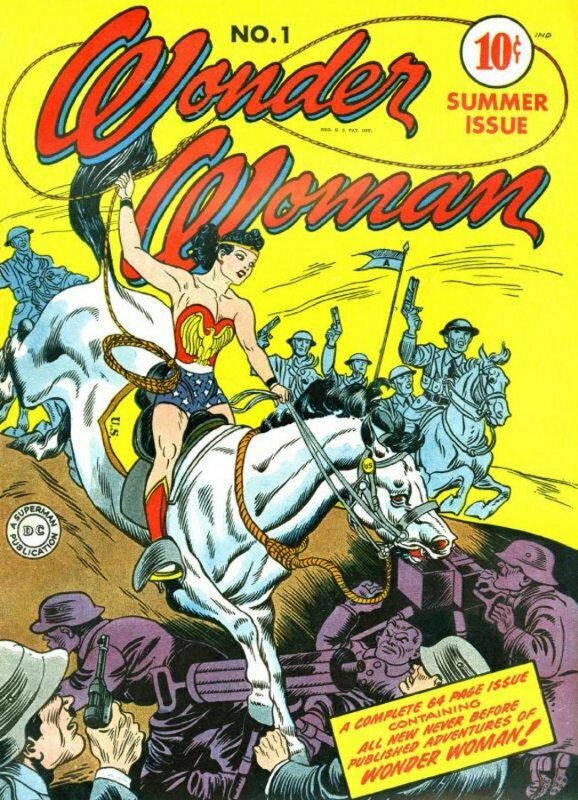 This landmark issue of the comic heralds the debut of William Moulton Marston’s iconic Wonder Woman character in her own exclusive full length comic title, initially published quarterly. This first issue contains a brief description of the character and four full-length stories. After her initial brief appearance in All-Star Comics #8 and nine appearances to date as the lead character in Sensation Comics, DC nevertheless already retcons her origin in a few different ways, most notably by giving her a Lasso of Truth before she leaves Paradise Island for the first time. In the previous continuity she only received the lasso after returning to Paradise Island in Sensation Comics #6. 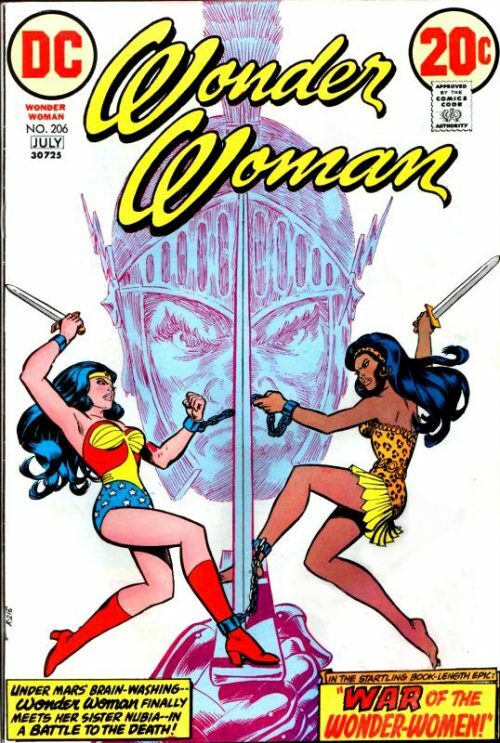 It’s worth noting that the third story entitled “Wonder Woman Vs. the Prison Spy Ring” was the inspiration for the first episode of the ABC TV show “Wonder Woman”, starring the iconic Lynda Carter, and which was called “Wonder Woman Meets Baroness Von Gunther”. 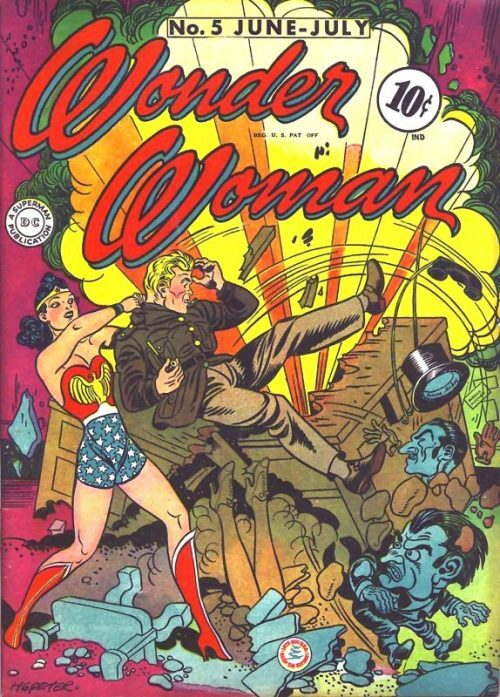 The issue’s first story begins at the moment that Wonder Woman arrives in the U.S. with an injured Steve Trevor. After dropping Steve off at the hospital, Wonder Woman leaves, but a parchment falls from her outfit and someone at the Smithsonian translates it to learn the history of the Amazons. It tells how Ares and Aphrodite are arguing over who shall rule the world – men with violence or women with love. Ares (quickly rechristened Mars) sends his men to enslave women throughout the world. Hippolyta, Queen of the Amazons, prays to Aphrodite for protection. Aphrodite gives her a magic girdle that bestows great strength and power. 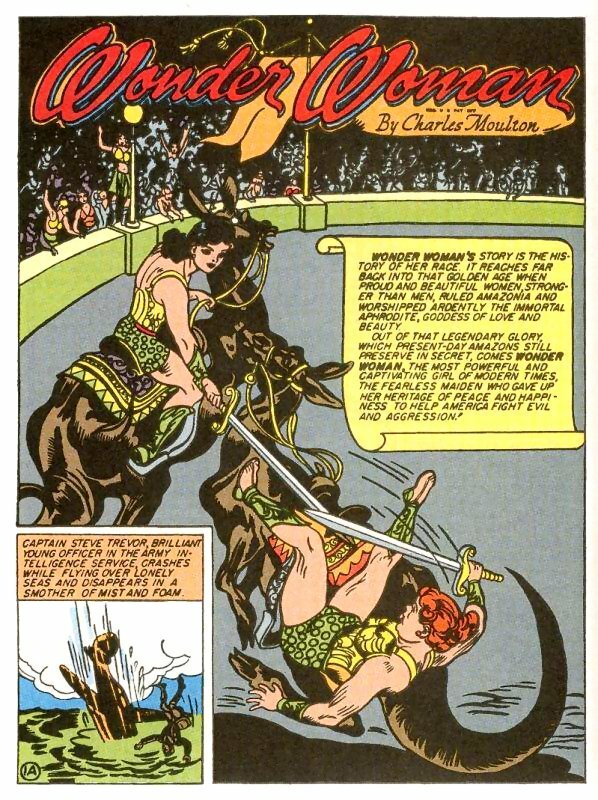 Hippolyta then leads her Amazons to victory over the men, who are led by Hercules. After surrendering, Hercules promises peace with the Amazons and seduces Hippolyta. When she is vulnerable he steals her girdle and he and his men enslave the Amazons. Hippolyta prays to Aphrodite, begging for help. Aphrodite agrees to give her the power to break her chains, but decrees that the Amazons must always wear metal bracelets as reminders that they must never submit to men. Should a man every weld chains to the bracelets again the Amazons will lose their strength. Now free, Hippolyta leads the Amazons to victory once again. This time, though, they leave “man’s world,” and travel to a far away island that they call Paradise Island. Here, without the influence of men, they are able to build a Utopian civilisation. Hippolyta wants a daughter, so she carves one out of clay and names her Diana, after the Goddess of the Moon. Aphrodite then grants life to the clay, and Diana, the Princess of Paradise Island is born. She quickly demonstrates her superior strength and speed, and grows to possess great beauty and wisdom as well. Years later, when Diana is a young woman, she and her friend Mala discover an American plane crashed in the water near the island. They swim to it and find Steve Trevor unconscious. They rescue him and Diana, who immediately falls in love with him, develops a light with a purple healing frequency that saves his life. Meanwhile, Aphrodite speaks to Hippolyta, telling her that war has claimed Man’s World, and that Mars will rule unless one of the Amazons leaves the island and defeats the Axis Powers who are causing war. Hipployta calls for a tournament to determine which Amazon will have the honor, but she forbids Diana from participating. Diana, though, desperate to return to Man’s World with Steve Trevor, wears a mask and competes without her mother knowing. She wins the tournament, triumphing over Mala in the final event: bullets and bracelets. Hippolyta has no choice but to send Diana to the U.S. with Steve. She gives her daughter her new outfit and the Lasso of Truth. Before she leaves, Diana consults with Steve, who explains that he was shot down while trying to chase a Japanese spy plane. 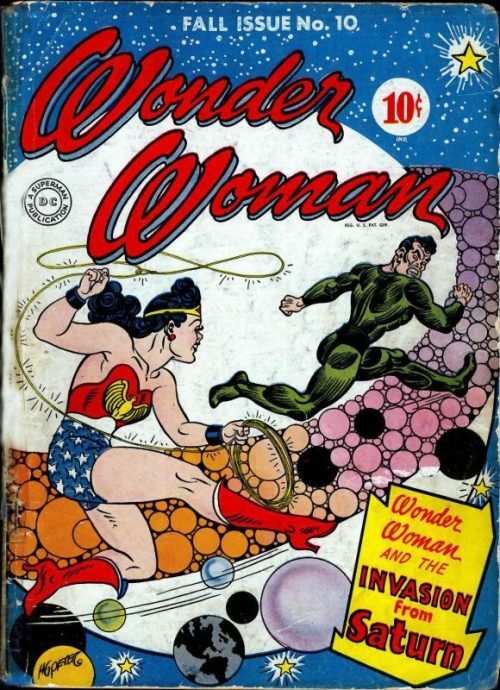 On their way back to the U.S., Wonder Woman tracks down the spy, who has landed on a small deserted island. She captures the spy and brings Steve back to the U.S. as a war hero. Diana appears as his nurse, but under the secret identity Diana Prince. The second story in this issue involves a circus coming to town. 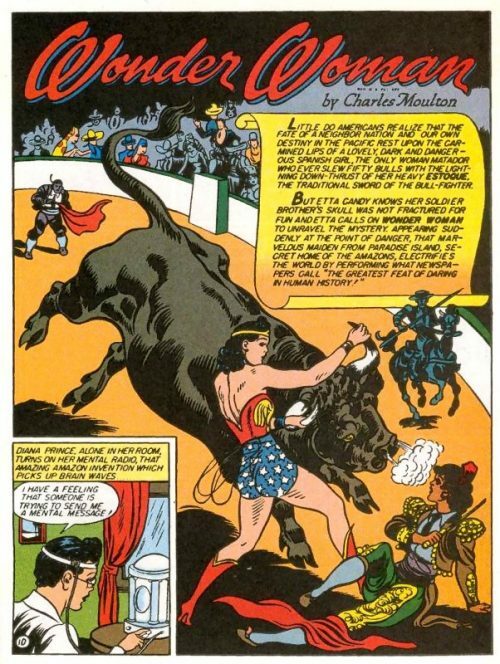 Diana and Steve Trevor visit the circus and discover that the elephants are dying of mysterious causes. Elva, one of the performers and the niece of the circus’s owner, explains that a group of Burmese men, led by San Yan, are taking care of the elephants, whom they worship as gods. Elva and Daring Dom Carney, the trapeze artist, are in love, but Elva’s Uncle Ed King won’t allow them to be together. Dom states that he doesn’t mind the elephants dying because it could cause the circus to fold and if that happens he can be Elva regardless of Uncle Ed King’s opinions. In the meantime, a group of thugs accost the Burmese elephant tamers, claiming that they must pay for “protection.” Steve intercedes and quickly beats up the thugs. At the same time, Elva is performing with one of the elephants, but it faints during the performance and crushes Elva. The elephant is dead, but Elva is alive, though trapped beneath it. Diana, who was watching from the stands, becomes Wonder Woman and rescues her. 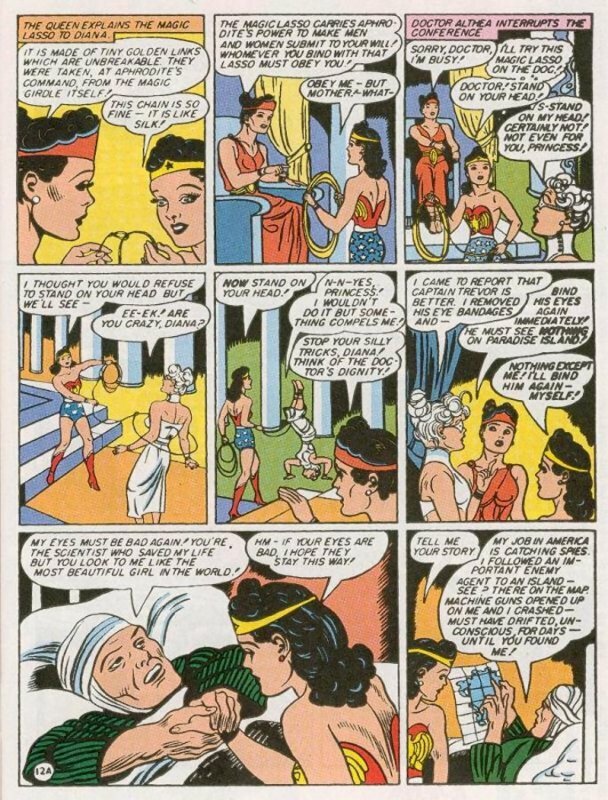 The ring leader asks Wonder Woman to perform for the audience while Elva recovers. 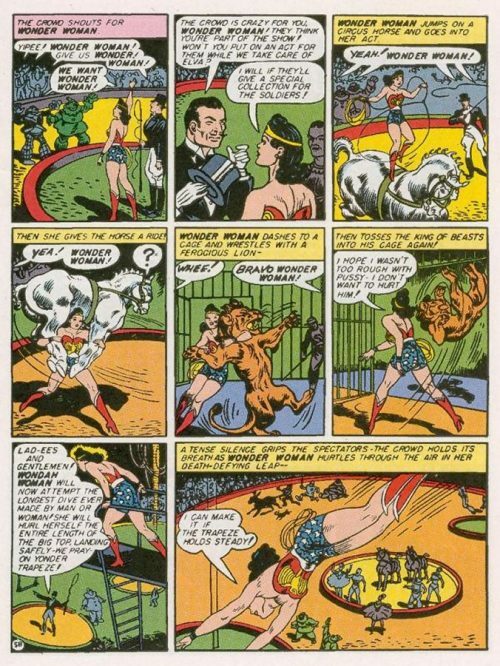 Wonder Woman proceeds to do a series of incredible stunts, but when she tries to do the longest trapeze jump ever performed someone tampers with the trapeze. She manages to catch it with her feet rather than her hands and the crowd goes wild. Ed King talks with Wonder Woman and Steve and expresses his fears that the dying elephants will ruin his show. Wonder Woman and Etta Candy dress up as a baby elephant to try to find out who is poisoning the elephants. 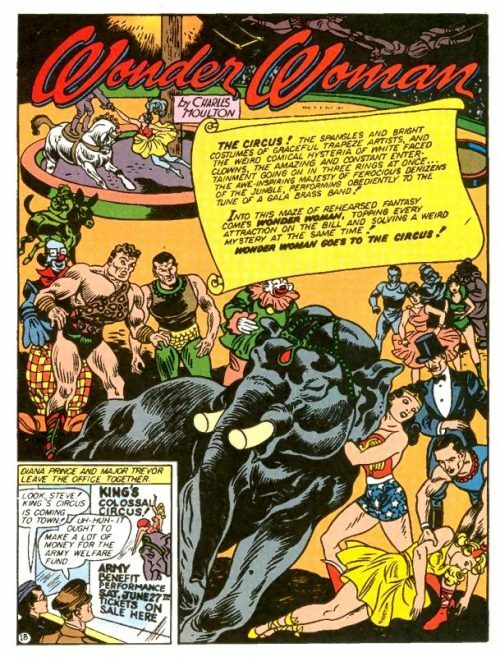 They find themselves in the midst of a Burmese worship ritual, in which the Burmese say that they will use the elephants to trample the “foreign devils.” Suddenly a large elephant appears and inadvertently blows Wonder Woman and Etta’s cover. The Burmese take them prisoner and plan to sacrifice them to the Elephant Gods. Meanwhile, the thugs return and take two of the Burmese men hostage. Steve Trevor follows them. Back at the circus, Dom Carney meets up with Elva, but Uncle Ed King also appears and fires Dom from the show under suspicion of being the person poisoning the elephants. An elephant, following orders from some of the other Burmese men, snatches Elva and makes off with her. Ed and Dom chase after them on horseback. Elva is brought to the same Elephant Temple that the Burmese have brought Wonder Woman and Etta to. The three of them are to be sacrificed for the Elephant Spirits. San Yan admits that his people have been killing the elephants to set their spirits free. Wonder Woman notices that San Yan speaks with a Japanese accent, so she breaks free of her bonds. Steve, Ed, and Dom all arrive, and as a group they defeat the Burmese men who are actually Japanese spies. Now free of suspicions, Dom gets Ed’s permission to be with Elva. Colonel Darnell and Steve Trevor discuss a recent Nazi attack on a U.S. ship that was only 10 miles offshore. Only the General himself knew of the ship’s orders, leading them to believe that a spy is giving information to the Nazis. Though Baroness Paula Von Gunther has been in prison for quite some time, they suspect that she might know something, so Steve goes to visit her. He brings Diana Prince with him. The Baroness refuses to cooperate, and when they try to attach a lie detector test to her she attacks Steve. The prison guards take her away, but she does not give up any secrets. Meanwhile, the Warden’s young son, Freddy, who loves to play Cowboy, has been practising his lassoing skills on his sister. She gets mad and sends him away. He comes across Diana’s suitcase and discovers her Lasso of Truth, which he takes to play with. The Baroness is led back to her cell, but it turns out that she is paying the policeman in charge of her. She has a secret door in her cell that leads to a Nazi base full of spies and The Baroness’s female slaves. The Nazis have captured a U.S. officer: Captain Loyal. He refuses to give up any information, so The Baroness tries to hypnotize him, but he resists. The Baroness then goes to the prison yard for exercise. She sees Freddy playing with the Lasso of Truth. He lassos his sister and she suddenly obeys his every command. The Baroness realises that the boy has the Lasso of Truth. She pays the guard to get the lasso for her. The next day, German U-Boats attack an American ship, but American planes fight them off. In the wreckage of the U-Boats the Americans find the body of Captain Loyal. Steve believes he is the spy, but Diana refuses to believe it. 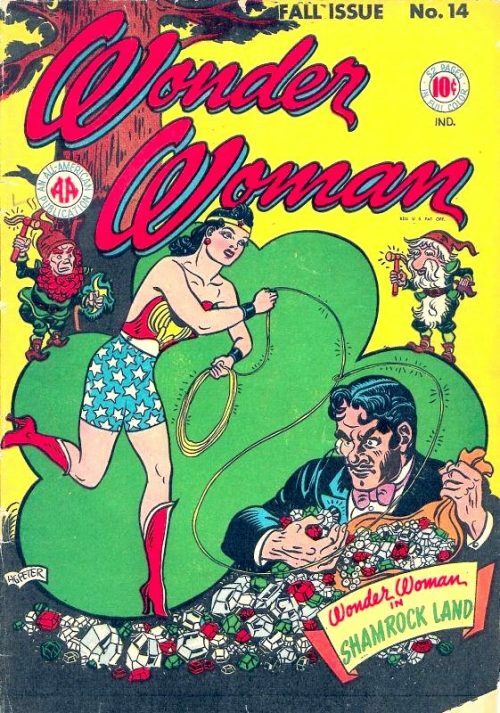 She changes into Wonder Woman to investigate, but finds her lasso missing. She visits the prison and sees Freddy practising with his old lasso. She teaches him how to throw the lasso properly, and during the lesson he mentions that he used to have a better lasso (the Lasso of Truth), but gave it to Guard Swipe. Wonder Woman seeks out Swipe, but finds him dead. The other guards accuse Wonder Woman of killing him, so she has to flee. Steve rushes to her aid and proves that Swipe was killed by poison, thus clearing Wonder Woman. 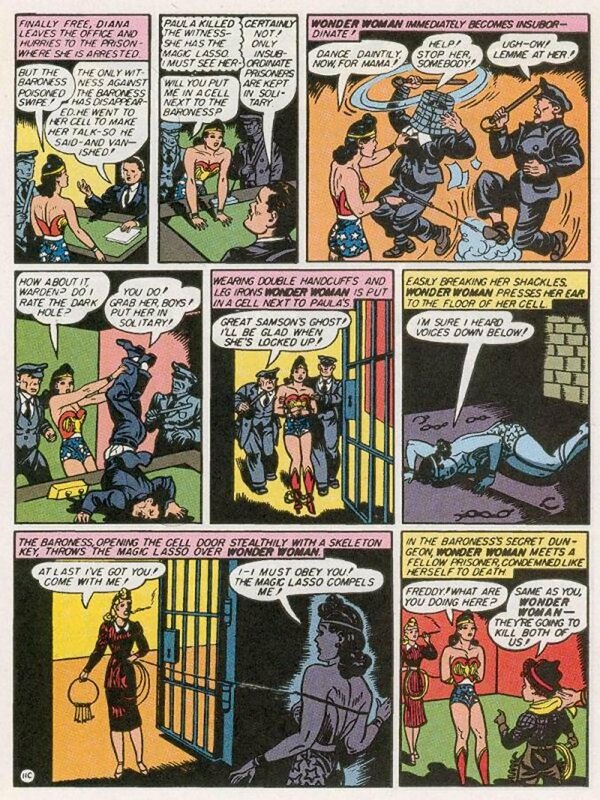 Wonder Woman goes to the prison again and arranges to be put in the cell next to The Baroness. 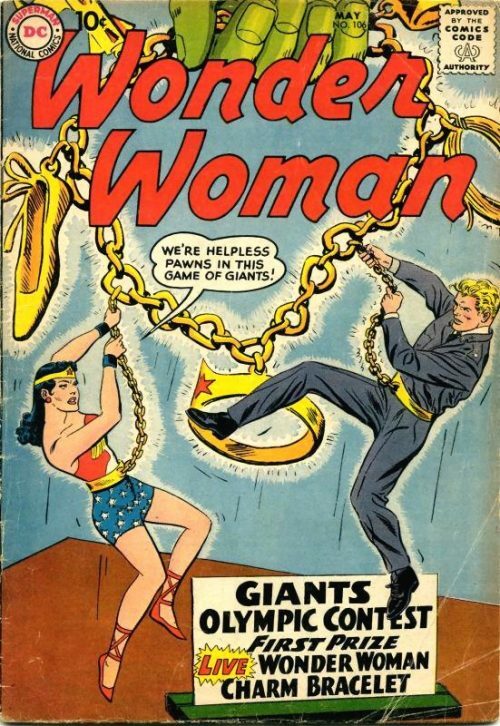 The Baroness comes to Wonder Woman’s cell and captures her in her own lasso. Now compelled to obey The Baroness, Wonder Woman learns that Freddy is also a prisoner. Wonder Woman can’t escape the lasso, but she does manage to throw her body into Freddy’s prison, breaking the bars and freeing him. The Baroness comes to get Wonder Woman under control, but Freddy lassos her using the skills Wonder Woman taught him earlier. The Baroness flees, but Wonder Woman follows her. Meanwhile, Steve has learned of a fortified U-Boat base on an inlet near the prison. He sends the U.S. Calvary in to destroy the base, but they take heavy losses until Wonder Woman arrives. The Baroness joins the Nazi ranks and Wonder Woman leads the U.S. soldiers. The U.S. forces prevail and, during the fight, The Baroness takes a stray bullet and is killed. Etta Candy calls Wonder Woman on her Mental Radio. Etta is upset because her brother, Mint Candy, who is a private in the U.S. Military, was attacked by spies while carrying a secret message in Texas. He bangs his head but is otherwise okay. The spies don’t get the plans because they are in Mint’s head, not on paper. Etta convinces Diana to go with her to Texas (where Etta is from) to uplift her brother’s spirits. As they travel they discuss men and Etta reveals that she has more use for candy than for men. When they arrive Mint takes them horseback riding. Pancho, a Mexican who prepares the horses, makes a mysterious phone call after they leave. They come across an old shaft house and a beautiful young Mexican woman is trapped in the mine. They rescue her and learn that her name is Pepita Valdez and she claims that an unwanted love interest threw her in the mine in anger. She and Mint become close despite Etta’s warnings. Pepita gets Mint to smoke a cigarette that contains a drug that makes him answer all questions truthfully. Pancho arrives and gets Mint to give up his secrets – that the U.S. forces plan to attack Japan by way of Alaska. Pancho goes to sell the information, but his horse trips and he falls. Meanwhile, Etta comes across Pepita who is still with Mint. Etta believes Pepita is trying to harm him and chases her off. 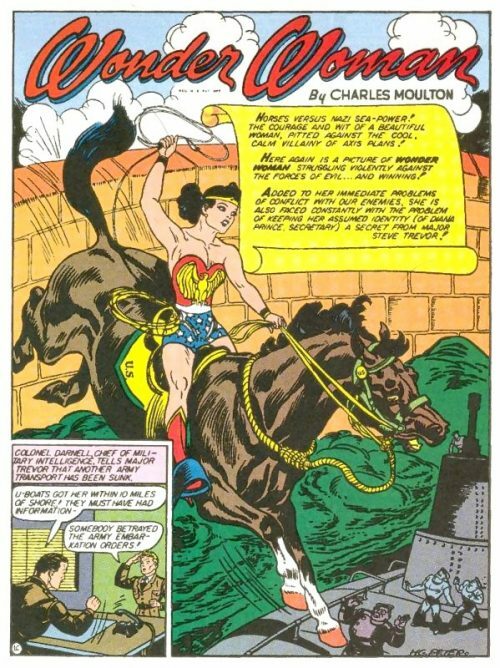 Pepita flees on horseback, but Diana changes into Wonder Woman and carries Etta in pursuit. They catch Pepita, but she has set up an ambush. Wonder Woman surrenders to the men so that they will lead her to their base. As all of this is happening, Steve Trevor learns that the Japanese have established a massive force in Mexico. He travels there to investigate, but doesn’t know where the Japanese base is exactly.. Etta and Wonder Woman are in the custody of Japanese agents, and are also bound for Mexico. The Japanese agents toss Etta out of their car, right in front of the car carrying Wonder Woman. This forces Wonder Woman to go ahead and break her bonds and she and Etta escape. In Mexico City they learn that Pepita is a Matador, and will perform that night. They attend the performance. Pepita is a great Matador, but when she faces El Terrifico, the strongest and most savage bull in Mexico, she is overcome. She is about to be gored to death when Wonder Woman intervenes, first using her strength to defeat the bull, then using her lasso to force the bull to do her bidding to wild applause. Pepita reveals that the only reason she is working for the Japanese is that they are holding her father hostage. She gives Wonder Woman the location of the Japanese base so that she can help. Wonder Woman takes the information to Steve, then surrenders to the Japanese so that they will take her to their base. Once there, she uses her Lasso of Truth to compel the Japanese General to surrender the base, which he does. Steve arrives with U.S. forces, only to realise that Wonder Woman has already won the day.